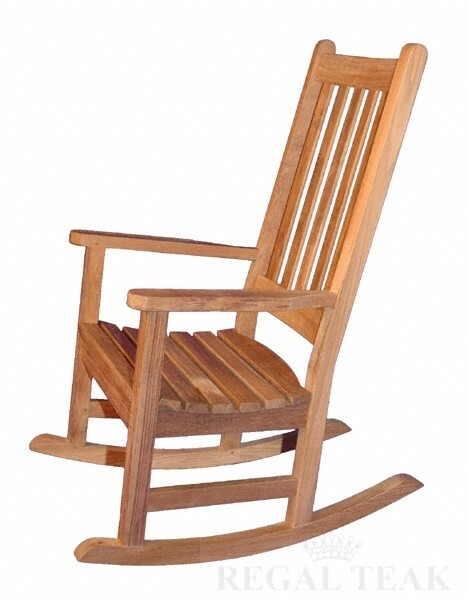 This beautiful, durable Carolina teak wooden rocking chair is ready to offer you many years of gentle enjoyment. This chair is equally fine for indoor or outdoor use. If used indoors it should keep its natural golden brown color for many years. If you use it as an outdoor rocker the sun will gently and naturally age the wood into a gentle silvery grey color. Meanwhile, this chair will remain incredibly durable and long lasting for many years. Teak is one of the hardest of the hard woods, which means this chair could well be with you for a lifetime. This rocking chair's classic, comfortable style makes it ideal for settling in for a long afternoon of conversation and relaxation with the people you love most. It is easy to clean with a soft brush and mild laundry detergent, and is easy to protect with teak protectors and oils. Teak has a natural ability to ward off rot, insects, and fungus, too. The high-quality craftsmanship makes it even sturdier. Mortise and tenon joinery and dowled construction with a Grade A kiln drying process ensures that you can feel extra-confident about this chair's quality and strength. 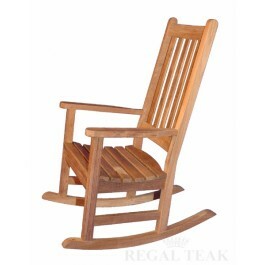 Order your solid teak Carolina wooden rocking chair today. Weight in Transit: 48 lbs.